Amanda [Running With Spoons] is extra awesome and not just because we share a love of like-minded books, almond butter and socks, it’s really because each week she hosts ‘Thinking Out Loud‘ – A place for your Thursday brain to go and relax. Need a blog-brain vacation? Join us! 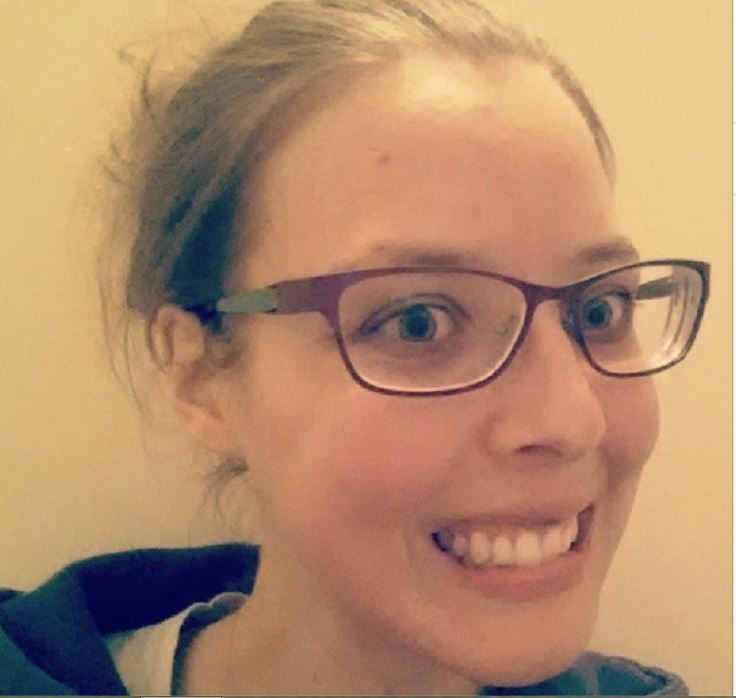 1 – Since you waited patiently – new glasses! Verdict is still out on the left eye. Ugg. 2 – I am rather fanatic about paying bills early, (or at the very least) most certainly on time. Last Friday I came about 15 minutes short of forgetting to pay February’s rent. I just completely forgot. I don’t even know what made me remember at 4:45pm that day, but it hit me and I [would have if I could] flew to the bank. I got there about 2 minutes before they closed. It kind of made me feel a tinesy bit like a crazy person. Please don’t tell me I’m the only one who felt blindsided by February’s arrival?! 3 – If you read my post over the weekend, you know that being majorly happy hasn’t been one of my strong points for a few weeks. I see this past weekend as a large turning point, though, and hope that my change in my thought process will help the healing process. During the process, I’ve been trying to run more frequently. One of my depression-fighters. 4 – I packed a big bag full of running clothes for all different types of weather – because we’ve had everything from 60 degrees to 10 degrees, and rain to snow this week – but so far I’ve mainly done really well at 1 – carrying it into my office and 2 – carrying it back out to the car. Mainly because – rain. Neither – carrying my bag to the office, or carrying it back to the car – seem to be helping the depression. But it’s a small step in the right direction? 5 – For a while now I’ve been wanting a stand-up desk. This job (that I’ve had for almost 3 years) is the first job I’ve had that really involves sitting for any length of time. Since switching to my new position in October (and having more of my Maslow’s hierarchy of (work) needs fulfilled), I’ve had time to explore options. And, articles like this that talk about how bad sitting is for you (and how regular exercise doesn’t combat the effects) were kind of my breaking point. Turns out stand up desks are mega expensive. A friend at work has her desk on blocks to make it stand up height – which also seemed cool – but my desk is ginormous and blocks just didn’t seem reasonable. (plus, she’s had major back surgeries, and so they sort of have to make it work for her). I had her help me see if we could redesign my space – and we were able to figure out a solution! It turns out, my monitors fit with no room to spare in the hutch-cabinet of my desk. In there, they are also the perfect height for me when I’m standing. It looks kind of rough right now – but it’s totally working. I plan to get a real wooden box made to replace the 3 boxes I’m currently using as a keyboard/mouse/writing area after I spend a few days to make sure I know what I want. I even went ahead and bought a shelf for my keyboard and mouse. It also gives me more storage space, too. This is the kind of shelf I bought. The best part? It was free. Only cost 14 dollars. 🙂 I’ll report back soon to let you know how I’m adjusting. 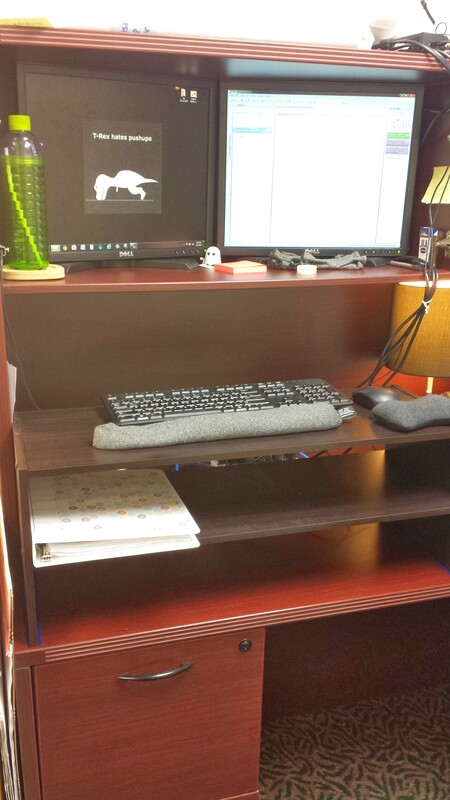 Stand up desk – day two – my legs hurt. But in a good way. Like, in a ‘I worked out’ kind of way. 6 – Ever since the fitbit-allergic-reaction about a month ago (which my arm is still healing from), I’ve been wanting to buy something else for workout-tracking. Mainly I want GPS tracking of my run. I’ve been looking at the garmin watches. Who has one? Thoughts? The Cat is getting a master’s degree in professional q-tip eating this morning. He also has an undergraduate in pawing at your face at 3am. 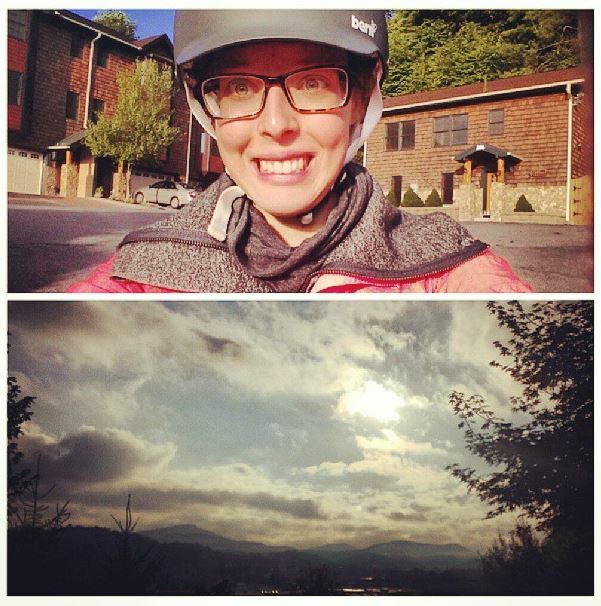 8 – I’ve been majorly itching to start biking and/or walking to work again. But, obviously haven’t, because – cold. Have you ever had an alternative commute method? Walking right now is probably my favorite. I picked up biking last summer because I had to be at work really early, and couldn’t leave early enough (aka – after the sun had started to rise) walking (it takes me exactly 28 minutes door to door walking, but 9 biking). When we move I hope we’re somewhere close enough to walk, bike or take public transit to work. I just don’t particularly love driving. I mean – I’ll do it – but I’d much rather spend the time elsewhere. And other than days that it’s -30 degrees I sort of feel silly driving 1.8 miles to work each day. 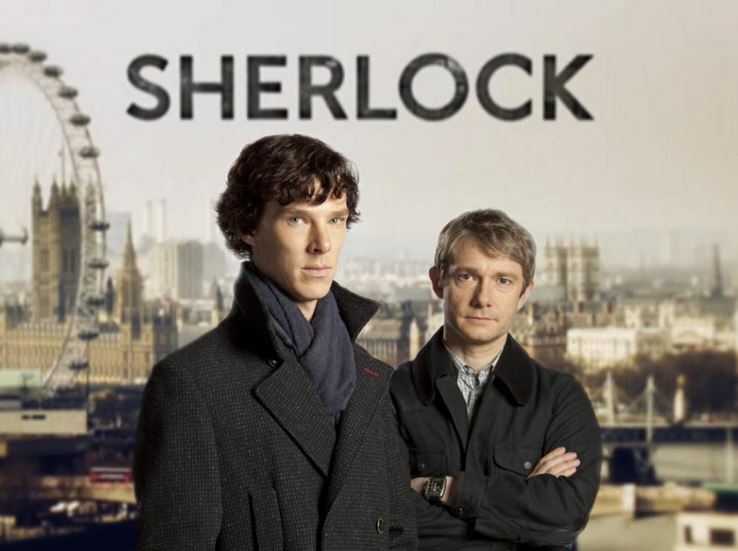 9 – Who else obsesses over the new Sherlock Holmes BBC series?! We watched season 1 and 2 on Netflix and streamed season 3 from PBS the past three weeks. If you haven’t watched it – do it now. Then be prepared to forget about it until the unknown when 4th season comes out – so you can, you know, still sleep at night. 10 – Speaking of watching – Do you watch Kid President’s youtube videos? Because you should. This one is my favorite right now. Want to read other fun Thursday posts? Click here! I find myself more exhausted after a day of sitting than anything, too. The counter-desk sounds great! ((And I swoon for working from home)). But yes, I would eat all of the food – although, I would probably have healthier food if I was home, though. I most certainly don’t like walking when it’s dark or cold either! It definitely only happens when it’s semi-warm! Watch it now! Sooo amazing!!! And we <3 Netflix! We don't have cable, and watch Netflix all the time!